Fourth Row Center: Film Writings by Jason Bailey: #Sundance Review: "The End of Love"
The End of Love is the second feature film directed by Mark Webber, whose primary vocation is as an actor (and a busy one; he appears in two other films at this year’s Sundance Film Festival). His debut feature was Explicit Ills, a tedious attempt at the Altmanesque multiple-intersecting-characters film; it hinted that Webber was a real director with a good eye, but that his screenwriting was cripplingly schematic. His new film is such an improvement over its predecessor that it almost seems a rebuke. 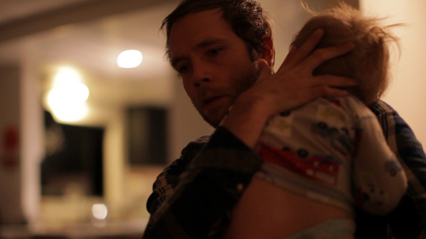 It’s an immensely personal picture, dwelling in an undefined hazy area somewhere between art and autobiography—Webber plays “Mark,” a young actor of some success who is struggling to raise his two-year-old son (played by Webber’s own boy, Isaac) after the unexpected death of the child’s mother. In sharp contrast to the rigid plotting of his first film, The End of Love has a loose, observational style, presumably heavy on improv (since you can’t really direct kids of this age, and they can’t usually learn lines either). The camerawork is intimately handheld; the scenes have a homey, snug, day-in-the-life quality. And Webber has good directorial instincts—he’s got a keen sense of when to cut simply, when to cut heavily, and when to wait a scene out. Plus, the kid is great. It’s no surprise to learn that he’s Webber’s own; you can’t create chemistry and comfort like that in rehearsals. Their byplay is utterly charming, and if (as a director) Webber is occasionally guilty of indulging in “look at the cute kid” antics, we’re bewitched by the sweetness of their interactions. For the film’s first hour or so, it basically plays like a documentary of their life together. Webber goes to auditions (he brings Isaac to a reading with Amanda Seyfried, which probably isn’t a great idea). He tries to pay his bills (at one point forced to hit up buddy Jason Ritter for a loan). He hobnobs a bit, going to a party at Michael Cera’s house with other young Hollywood types. And he meets Lily (Shannyn Sossamon), a beautiful single mom who looks like a real possibility. And then he blows it. He’s still grieving for his lost love, and is dealing with it like a rookie: by trying to replace that relationship as quickly and directly as possible, which leads to him saying all kinds of inappropriate things at exactly the wrong moments. When it happens a second time, we’re no longer wincing at his miscalculation; we’re realizing that there are serious emotional problems to be addressed. All of this leads up to a remarkable scene where he finally gets up the stones to be truthful with Lily, marking Webber’s most impressively forthright acting in the film. The End of Love is a disarmingly candid character study, and the character’s proximity to the actor playing him is an open question that keeps the audience both intrigued and uneasy. We watch with voyeuristic curiosity as his smooth talk and together-guy act peel away, revealing the mess underneath—a childish, petty, and terrified kid who’s been prematurely vaulted into more than he can probably handle. The film is a little bit precious, but it is filled with poignant and powerful moments, and confirms Webber as a writer/director worth watching. "The End of Love" screened this week at the Sundance Film Festival; its final showing is on 1/27.